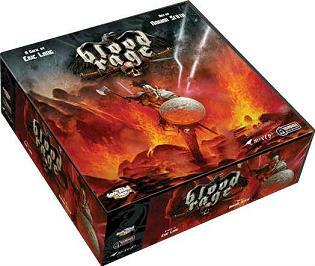 In Blood Rage, each player controls their own Viking clan’s warriors, leader, and ship. Ragnarök has come, and it’s the end of the world! It’s the Vikings’ last chance to go down in a blaze of glory and secure their place in Valhalla at Odin’s side! For a Viking there are many pathways to glory. You can invade and pillage the land for its rewards, crush your opponents in epic battles, fulfill quests, increase your clan`s stats, or even die gloriously either in battle or from Ragnarök, the ultimate inescapable doom. Most player strategies are guided by the cards drafted at the beginning of each of the three game rounds (or Ages). These "Gods` Gifts" grant you numerous boons for your clan including: increased Viking strength and devious battle strategies, upgrades to your clan, or even the aid of legendary creatures from Norse mythology. They may also include various quests, from dominating specific provinces, to having lots of your Vikings sent to Valhalla. Most of these cards are aligned with one of the Norse gods, hinting at the kind of strategy they support. For example, Thor gives more glory for victory in battle, Heimdall grants you foresight and surprises, Tyr strengthens you in battle, while the trickster Loki actually rewards you for losing battles, or punishes the winner. Players must choose their strategies carefully during the draft phase, but also be ready to adapt and react to their opponents` strategies as the action phase unfolds. Battles are decided not only by the strength of the figures involved, but also by cards played in secret. By observing your opponent`s actions and allegiances to specific gods, you may predict what card they are likely to play, and plan accordingly. Winning battles is not always the best course of action, as the right card can get you even more rewards by being crushed. The only losing strategy in Blood Rage is to shy away from battle and a glorious death!